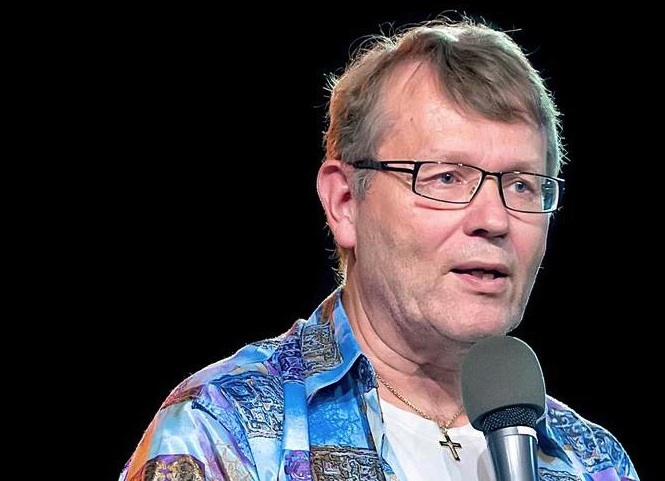 Norwegian pastor Sten Sørensen wants to remove israel flag and Israeli songs from Christian meetings and assemblies. Pastor Stian Sørensen wants to remove everthing Israeli from churches in Norway. – There are better ways to communicate with young people, he says. On May the 10th pastor Sten Sørensen lead 1,500 Norwegians in a support marking for Israel outside parliament in Oslo with hundreds of waving Israeli flags. Now he warns against the use of Israeli flag and Israeli songs at Christian meetings. – Remove all israel flag Norwegian meetings and assemblies. And one more thing: Drop israel songs, says Sørensen in a “firebrand” the magazine “Korsets Seier”. – Her er det viktigere ting på spill. Vi gjør oss selv en bjørnetjeneste. Vi skaper en merkelig nestenjødisk kultur. Noen begynner faktisk å feire sabbaten og andre jødiske høytider. Vi er ikke jøder. Vi skal heller ikke prøve å være noen reservejøder. Menighetene må ikke bli halvsynagoger. Vi er nordmenn, og det var det Gud hadde tenkt. Vi skaper unødvendig avstand til unge kristne, muslimer og andre nordmenn. – Important issues is at large. We are coming mistakes, and creates an sub-Jewish culture. Some even starts to celebrate the sabbath and other Jewish feats. We are not Jews. And we must not try to become replacement-Jews. The Church must not come a half-synagogue. We are Norwegians, and that is what God intended us to be. We are creating a not wanted distance to young Christians, Muslims and other Norwegians. Source: The weekly of the Pentecostal Church of Norway. I wonder if Stian Sørensen include Messianic Jews as followers of the Messiah? Do he desire to see them removing Israeli flags, and stop singing Israeli songs? I wonder if pastor Stian Sørensen is aware that the Bible is a Jewish book? That every line in this book is written for Jews by Jews? When Pastors like Sørensen wants to please Muslims and not-Christian Norwegians, they should not only remove Israeli flags. They should also remove the Bible. Because all who hate Israeli flags, also hate the word of God. To preach the gospel is to honor God of Abraham, Isaac and Israel. The Son of God is a Jew. He is the restorer of the state of Israel. What took place in 1948, 1952, 1967 and 1973 are the best proof in our generation that there is a living God. Jesus the Messiah defeated the ungodly Arabs. He is the rock of Israel, the king of the Jews. So Pilate asked Jesus, “Are you the king of the Jews?” “You have said so,” Jesus replied. An Arab Zionist pastor from Israel had the following message to all anti-Zionists who claim to know the Messiah. “Replacement theology is not from God of the Bible”. The copy-cat “Jesus” who demands the removal of Israeli flags, serves the kingdom of darkness. It is a disgrace that this man was presented as a Friend of Israel at a pro-Israel rally in Oslo. With friends like this, Israelis do not need enemies. You say that ‘replacement theology is not from God of the Bible’ this is true, it is man’s attempt to make the Bible support his own agenda. Peter had a dream, in it a cloth came down and he saw unclean foods laid out. When he woke he understood the dream to mean that what came down from heaven was not just for Jews but for all mankind and he went and preached the Gospel to the gentiles as well. There are verses that say, to the Jew first and then to the gentile. Jesus was born a Jew, and He kept the feasts as a Jew and He was among the Jews first, the Pharisees who were the Religious authority of the time, rejected Him and stirred up those who feared the Pharisees, against Christ which led to the crucifixion, resurrection and ascension to heaven. Having been rejected by the Jewish religious authorities, the message went out to everyone else. The Bible is inspired by God, for all mankind. Please accept this in the spirit it is intended. The Bible is inspired by God, for all mankind. Please accept this in the spirit it is intended. The Bible is a Jewish book. The infallible Word of God was revealed to Jews, who wrote the words down. The Hebrew Bible. The fist five books was written down by Moses, or someone close to him. Both sons of Jacob. This is supposed to be A.B.C about the Bible. Yes, the Bible is a book that is available to gentiles too. And they can be saved and grafted into the Jewish faith in God of Israel by a Jew. Yeshua (Jesus) the Messiah, the Son of God. True Christianity is when it reflects its Jewish heritage. It’s the work of the devil to seperate Jesus from the Jews. The Gentiles are a grafted branch…meant to share in the roots of the Jews. The more any country moves away from Israel, the Jews and God’s people the more God promised to send them “The Curse”!!! What is ” The Curse”? Allah = Strong’s #422/H422. One objection: Jesus is NOT a Jew. Jesus is the Son of God. He could have been a Jew if He had shared Mary’s or Joseph’s nature. As far as I know, He did not share their sinful nature. Otherwise, He could not have been the sinless Son of God to be able to make expiation for our sins. If He had something from Mary’s nature, sinful characteristics would have gone into His nature, ruining the Plan of Salvation. God bless you. Glad Israel has friends in Norway, not only enemies. He did 100 per cent share in our nature. But he never sinned. Because He was also 100 pent God. Uniqu. No one else like Him. In your relationships with one another, have the same mindset as Christ Jesus: Who, being in very nature, God, did not consider equality with God something to be used to his own advantage; rather, he made himself nothing by taking the very nature of a servant, being made in human likeness. And being found in appearance as a man,he humbled himself by becoming obedient to death, even death on a cross! Human nature, yes, but not a sinful nature, because He was not conceived by a man, but by the Holy Spirit. So, that means the Holy Spirit conceived baby Jesus in Mary’s womb. Jesus came completely from the Holy Spirit. If Jesus had Mary’s or Joseph’s nature, He would have shared in their nationality, being a Jew. If Mary’s sinful nature had been transmitted to Jesus by birth, He could not have been the Saviour. So, He is the Son of God, God manifested in the flesh. That’s the point I wanted to make. Stay blessed! Jesus was a Jew because he observed the Laws of the Jews. 27And he who is physically uncircumcised, if he keeps the Law, will he not judge you who though having the letter of the Law and circumcision are a transgressor of the Law? And Mary was still his mother whether Jesus took on sinful nature or not. And I believe you’re right that Jesus did not inherit sin because Paul says Jesus was a new Adam, a new creation. But He was still a Jew , tempted as Adam was tempted. The bible is a hebrew book written by hebrews. Abraham isaac jacob david etc etc were not jewish but israelites..the term..jew..came to play after the break up of the kingdom of salomo. 2 tribes, benjamin and judah, with thr levite priests, became the southern kingdom of judah, decendants of these two tribes r called jews, though, the 10 northern tribes, with capital samaria, were taken captive up north to assyria, and r scattered all over the world till this day. This house is being called, house of israel or joseph. This is the fullfilent of the blessing of jacob to josef. Jacob blessed efraim and manasse and efraim would become a father of nations..wich r mostly european and american countries. So norway and the other scandinavion countries..such as danmark ( tribe dan??) r decendants of the house of josef, thus the 10 tribes. Jesus said that he cake for the lost sheep of israel…here..the 10 tribes who were out of covenant. The two tribes benjamin and judah, thus jews, returned after thr babylonian captivity back to judea, with temple and thus in covenant. The gentiles, people without covenant, read the 10 tribes and the foreigner with them, have now, in jesus an offer to reach to YHWH, so we r coming home. Dont make a mistake that once ur a christian, u have another kingdom and other rules. 1 people, israel, 1 king, jesus, 1 kingdom, 1 law..meaning..the sabbath is the sabbath for all. Sunday and xmas and bla bla is not part of Hid kingdom but baptized paganism..something we should get away from. This pastor is full of nonsense..